This year’s Design Week, which just came to an end, was filled with tons of events, including the obligatory visit to the mother ship: the Javits Center, where the International Contemporary Furniture Fair was spread over the football-field-size space. I started my trek delighting in the photorealism of Mineheart’s wallpaper. Who says you can’t live like a king? Over at the Astek booth, Lindsey Pout explained that the firm can work with designs you submit. This goes for wall and floor coverings. Have fireplace envy no more: Hearth Cabinet makes it possible to install safe and ventless fireplaces in spaces that have never seen a roaring fire; in fact, this company developed the only ventless fireplaces approved for New York City. The fire was even crackling! Donald Trump Jr. has one. 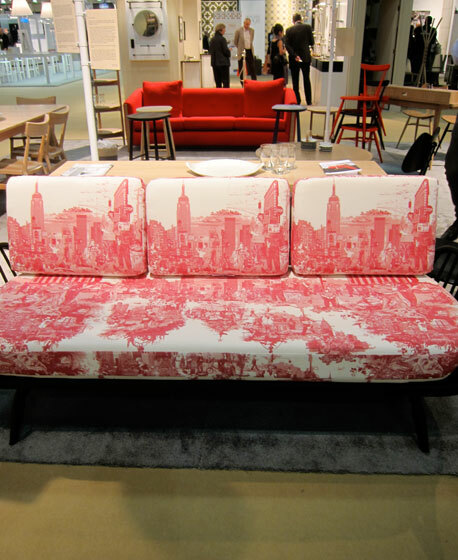 This couch with fabric depicting the New York City skyline by Timorous Beasties is from the British company Ercol. They had lots handsome furniture. It was their first time at the fair here in New York City. One of the most understated and elegant new designs I saw at ICFF was this series of braided nylon cords with lights attached, courtesy of a new design team, Alexandra Burr and Allen Slamic of AlexAllen Studio. They also showed the lights as a shelf bracket, which combined the light and shelf in one—really clever and fun. Back at Wanted Design, these playful light stools stood out. They’re from Brazilian designer Renata Moura. Let’s just say it in one more time: Tom Dixon is a genius. Dixon had 3-D printers set up on site to show the making of some of his new lighting fixtures. Here, the Base Table Light in copper and the Cell Light on top of one of the new “extreme polished” surface tables. The commute between the Javits and the Terminal Building where Wanted Design took place involved walking over the abandoned railroad tracks that will transform into the Hudson Yards. Craig Murphey (left) Ten Eyck Street and Union Avenue, Williamsburg. Early in the morning of October 18, 2007, Murphey was biking home from escorting his date to her South Williamsburg apartment. According to police reports, Murphey attempted to outrun a gas truck turning left on Ten Eyck Street. His pelvis shattered on impact, and he was pronounced dead at the scene. In his honor, over 40 friends have since received tattoos that read BE BETTER. Frank C. Simpson Linden Boulevard near 175th Street, St. Albans. Simpson, a janitor returning from the evening shift at a Con Edison facility, was hit by a Dodge Stratus on November 9, 2006. Jose Mora (left) North Conduit and McKinley Avenues, Cypress Hills. On September 4, 2006, 11-year-old Mora was on his way to the barber for a back-to-school haircut; that week, he was to start the sixth grade at nearby Junior High School 302. He was struck by a Honda while walking his bike across an intersection. Jonathan Neese South 4th Street and Roebling Street, Williamsburg. On August 12, 2006, Neese, a bike messenger known as “Bronx Jon,” was struck by a livery cab while cycling from Brooklyn to Manhattan. Sam Khaled Hindy (left) Base of the Manhattan Bridge. On November 16, 2007, Hindy was run over after mistakenly entering a Manhattan Bridge lane reserved for cars. Habian Rodriguez Main Street and Horace Harding Expressway, Flushing. On September 1, 2007, Rodriguez collided with a city bus and died 30 minutes later. Elizabeth Padilla (left) Fifth Avenue and Prospect Place, Park Slope. Commuting to the Brooklyn Bar Association on June 9, 2005, Padilla swerved to avoid the open door of a parked P.C. Richard’s truck. She lost control of her bike and fell underneath the wheels of an ice-cream delivery truck. Juan Luis Solis East Gun Hill Road and Bouck Avenue, the Bronx. Attempting to pass a double-parked car on June 22, 2007, Solis was struck by a box truck and died of severe head trauma. The truck did not stop. Jeffrey Moore (left) Chauncey Street and Rockaway Avenue, Bed-Stuy. According to witnesses, on May 29, 2007, Moore was run over (twice) by his girlfriend Jeanine Harrington. She was indicted on charges of murder and criminal possession of a weapon (her Nissan Pathfinder). Derek Lake Houston Street and La Guardia Place. On June 26, 2006, Lake reportedly skidded on a steel construction plate and was crushed underneath the wheels of a passing truck. Elijah Armand Wrancher (left) Springfield Boulevard and 130th Avenue, Springfield Gardens. On August 28, 2007, 12-year-old Wrancher attempted to ride his bicycle while holding onto a moving truck. He lost his grip and fell under the truck’s rear wheel. David Smith Sixth Avenue and 36th Street. On December 5, 2007, Smith was biking up Sixth Avenue when the passenger-side door of a parked pickup truck opened unexpectedly. He was knocked into the path of an oncoming truck. Anthony Delgado (left) Palmetto Street and Central Avenue, Bushwick. Shortly after midnight on April 29, 2007, 13-year-old Delgado borrowed a bike to head home from his friend’s baptism party. As he crossed the intersection, he was struck by an SUV. Carolina Hernandez 57th Avenue and Junction Boulevard, Elmhurst. On August 16, 2007, Hernandez was riding to a mall when she was struck and killed by a Chevy truck. The driver pled guilty to driving with a suspended license. Big, fake, and fully able to outshine its surroundings.Big, fake, and fully able to outshine its surroundings.